have a different pair of shoes to wear with each outfit or outing. But, that is really not cost-effective if you are on a budget. Although I have lots of shoes in my closet now, I wanted to find some new wedge sandals to buy so that I will be ready to go anywhere this spring and summer. I love shopping on the internet and usually can find exactly what I am looking for if I look long and hard enough. I love to reading reviews of shoes on Amazon and manufacturers’ websites. This helps me to narrow down my choices to the Top 5. This is exactly what I have done for this article. I narrowed down my choices and actually have bought one of each of these brands of shoes. I decided that I liked the Crocs Leigh II Ankle Strap Wedge Sandals the best out of all of them. They are VERY comfortable on my feet. I just love these!!! I knew that Crocs had a great reputation for being environmentally friendly and made quality shoes. But, I have never owned a pair until now. The 3 inch heel on this one really feels like a smaller 2-inch heel when walking in them. Keep reading and I am confident you will see why I chose these as the best of the best. 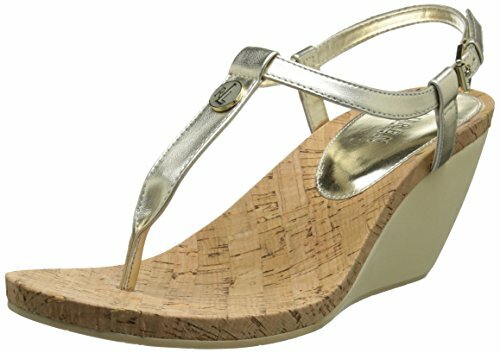 Crocs Leigh II Ankle Strap Wedge Sandals – The Best Wedge Sandal! When it comes to shoes, women often have to make a choice between style or comfort. It’s a rare shoe that delivers both, and when you find one that does, you should jump on it, especially if the price is right. One popular shoe that delivers on both that you should consider if you’re in the market for a new pair is the Crocs Leigh II Ankle Strap Wedge. Crocs reputation was built on the idea of highly comfortable shoes, but those early shoes could never be considered stylish by anyone. 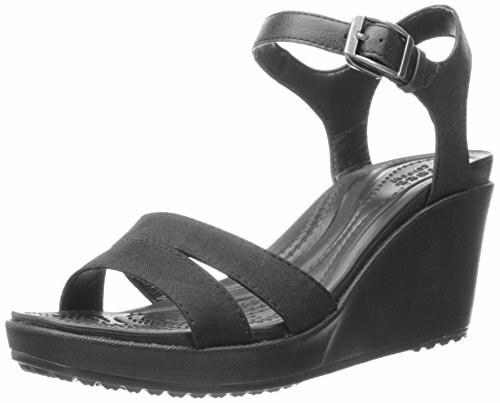 With their latest offering, the Crocs Leigh II Ankle Strap Wedge Sandals, that’s no longer case. These shoes exhibit a sense of style women love combined with unparalleled comfort that the Crocs brand has become famous for. At first glance, you might think these shoes are made of leather, but you would be wrong. The shoes are made of synthetic, man-made material that only looks like leather. This feature should appeal to women who may have issues with purchasing clothing items made out of animal material. It should also appeal to most other women as well because Crocs is able to keep the price lower by not using animal-based leather, and they do so without compromising on quality. The only thing women might love more than shopping for shoes is saving money while shopping for shoes. These fill both needs. Despite having a heel height that is just over 3 inches, through some sort of shoe magic, Croc has managed to make a 3 plus inch heel feel and wear like a 2 inch heel. If you’ve ever worn 3 inch heels, you know how much more comfortable a 2 inch heel is in comparison. In this shoe you get the benefits of a 3 inch heel without the discomfort that usually comes along with it. The Crocs Leigh II Ankle Strap Wedge is available in a variety of colors that should appeal to a variety of shoe shoppers that include black, oatmeal, tumbleweed, storm, and berry. Berry really stands out and would be an excellent choice for a night out on the town and is sure to get tons of compliments. Coming in at just under $30 a pair, these are affordable enough that most people can pick up a couple of pairs or more. If you’re really motivated, pick up a pair of each color and wear a different one each day of the workweek. Your coworkers may think you’re crazy but you’ll be the one knowing how envious they would be if they only knew how comfortable your shoes are, and they’re stylish too. This one is the best of the best. Are you searching for the best wedge sandals on the market? The Annadel Eirwyn wedge sandal from Clarks is the ideal product for you. It is considered one of the most comfortable pairs of sandals on the market today. It will take you from a Sunday brunch to a tropical getaway in grand style. Wearing this versatile shoe is similar to adding a spring in your steps. The trendy crisscross leather straps make these one of the most sought-after for all spring and summer occasions. 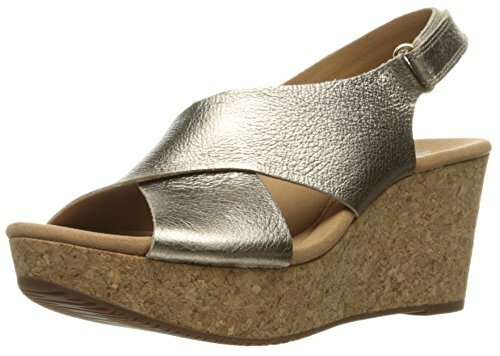 The versatile shoe comes with a low cork wedge heel – which offers stability for all-day wear. The adjustable hook-and-loop closure provides a personalized fit for your feet. The comfort of your feet is guaranteed with the latest technological advances such as shock absorption, Ortholite footbed, and a rubber outsole. The Annadel Eirwyn Wedge Sandal is designed for all women between the ages of 19-46 years. Clark has been offering uniquely styled shoes with built-in technology for the past 180 years. In fact, they are one of the largest and most-respected footwear companies in the world today. That is why you need not worry about the quality of the Annadel Eirwyns. They are of the highest quality compared to the competition on the market. The Annadel Eirwyn is comfortable and beautiful at the same time. The shoe has some platform built into the height in order to guarantee your comfort. The textile lining adds breathability to the product. The majority of women who purchased these shoes have reviewed the product quite positively. Many of them have praised them for their beauty, comfort, and durability. Overall, this is a great shoe that you can wear to many different functions and outings. When it comes to footwear, we have numerous options. However, across all the options that we have, more often than not, we are interested in comfort and style. A pair of shoes needs to have ample comfort for you to wear them as long as possible. We want our shoes to be cute, trendy, beautiful, and eye-catching. The shoes you wear should make you stand out while making sure you are comfortable at the same time. These are considerations that Bungalow Wedge Sandal has kept in mind while developing their various lines. This is particularly true for their Bungalow Wedge Sandal line, which not only bears stellar aesthetics but is one of the most comfortable strap wedges on the market. In fact, Blowfish, the maker of Bungalow Wedge Sandals, has gone out of their way to travel the world, seeking inspiration for what a good pair of sandals should be. Theirs is not a random design that they settled on out of the blue or copied from other makers. The Bungalow line has been intricately designed to look cool on your feet and be comfortable to wear. With regards to comfort, this one has been designed with perfect dimensions for a wedge in mind. Additionally, the straps a not too thin nor are they too wide. These also have fewer straps than other ones. The zipper is small and is the perfect shape and size for comfort. If you are looking for the best wedge sandals on the market, you have come to the right place. Blowfish Balla is one of the best wedge sandals on the market today for women. It suits any woman between the ages of 19 to 46 years. 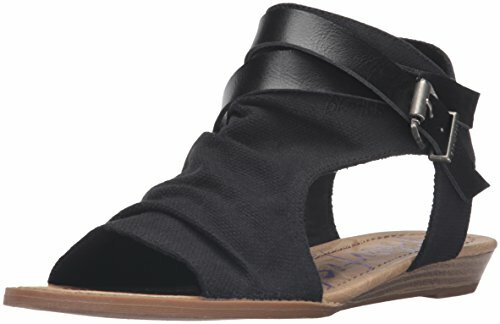 This unique product from Blowfish Malibu comes with a micro-wedge heel, accent ankle straps, inside zipper, textured canvas upper, synthetic outsole, and an open toe silhouette. The signature slightly-cushioned foot-bed is a salient feature of Blowfish shoes. With the style and comfort that Balla offers, you won’t feel like taking them off. These shoes are very trendy. They will look adorable with a pair of shorts and cute with skinny jeans. The Blowfish Balla is geared towards the free-spirited cool girls out there. In fact, you will always find something unexpected in every Blowfish Balla product. You get a full range of sizes, colors, and styles to choose from. The majority of customers have rated the product quite highly. In fact, many of them have said that the shoes offer the perfect fit for them and it fits true to size. They look much cuter on longer and skinny feet as per some of the customers who already wear them. The looks and comfort of the product have made it one of the favorite selections of many clients out there. If you are searching for the some of the most comfortable sandals on the market, the Blowfish Balla is the ideal product for you. The product is comfortable, beautiful, durable, stylish, and looks cute at the same time. Finding a new pair of wedge sandals does not have to be difficult to do. However, for some people, they tend to make this more of a challenge than what it needs to be because of the selection of brands on the market. To avoid this, you should learn about Lauren by Ralph Lauren women’s Nikki style. This one has a 3-inch heel that you will enjoy. These look very classy and elegant while on your feet. The elegant look of them and how they look like a heel would be appropriate for office attire. They are also suitable for less formal outings. So you will be able to use these at the beach if you want. A common issue I have found with the sandals is they always tend to come off of my foot really easily. I do not know if it is my foot or the way the strap works on the shoe. However, when I started to wear this I found it has a great strap that with a buckle enclosure around the back. This makes it easier to keep it on my foot and not have to be concerned about it slipping off when I am doing a power walk to the next destination. Well, I have to admit I was a little bit on the lost side when I started to look at all of these types of shoes on the market. I mean, I literally went to lots of different websites and found out that there were hundreds of variations. Finally, after much work, I found the Lauren by Ralph Lauren Nikki model to work best for my needs to help me get the shoes I needed to have for work and play. If you decide to buy any of these, you can be confident that you’ve found the best of the best wedge sandals.